Hi, I am a new Kia Sorento 2013 owner, 2.2 CRDi model, silver. Formerly driving a Skoda Superb I for the past 7 years, built like a tank, fuel economical and powerful with 1.8T under the hood. 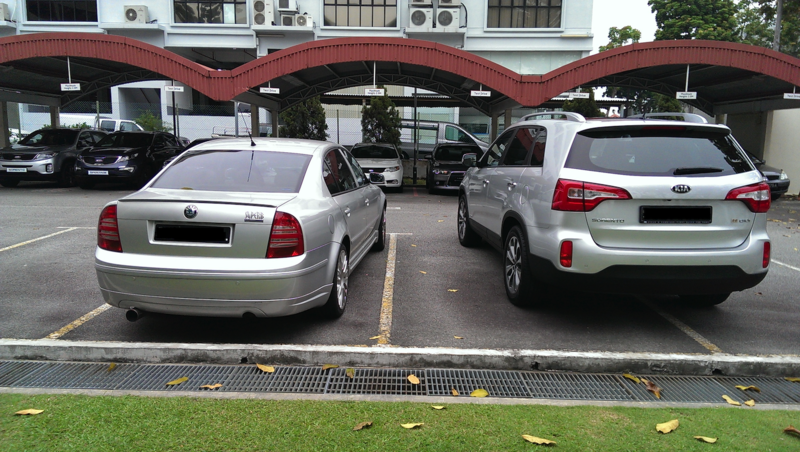 Wanted a SUV all along and finally chose the KIA Sorento 2013 model in Singapore due to several reasons. 1. Korean built has improved tremendously, quality and class. 2. Award winning diesel engine. - 436NM Torque, 194HP, Eco-friendly and if you are like me, someone who drives a lot, it is cost savings back to you. 3. Features, FEAtures, FEATURES!! - Tons of it, Bluetooth, Cruise Control, HID, AWD, Park Assist (found in VW range, includes, Skoda, Audi and VW cars), Dual Climate Zone, Reverse Camera, Moon Roof, plus Sunroof...19" wheels...etc. 4. Design - base on the individual, but I really like the design. Former Audi chief designer. 1. Hard plastics - dashboard. This can be improved. In summary hope to say hello to fellow KIA folks and a shout out to other Sorento owners out there. PS: My first Korean car! Have you considered how you'll refuel when you drive up north? Good choice, i must said. care to share how much u bought it? any idea how much is the road tax u paying per year? i checked it out recently n noticed it doesnt have a button power liftgate? Why do you choose diesel over petrol? Will it be quieter than petrol variant 3-4yrs later. What is your avg annual mileage? What is the OMV for your 2.2 CRDi model? do the front car seat ventilated and got ipod connectivity? if yes i would consider and hows the fc? nice , sturdy , strong looking SUV. (i) Why Diesel - my previous ride has high mileage, 250,000km after 7 years. Base on my pattern and mileage per year and after some diesel drivin buddies advise me and helped me calculate, it makes sense for a diesel and every year if I pass 21,000 or more KM I would have had my ROI. Hope that made sense, I got it calculated from several people for this. Some VAG pals whom drive their rides top up North, goes with a 20L jerry can this should be sufficient to return back to SG, HOWEVER if you go for longer drives, you have to change your filters when you are back in SG, this honestly maybe a hassle. But love the torque and so far fuel consumption seems like it will be good, just taken the ride 2 days only, so can't really tell yet, so far this is my quick 2 day summary. Overall ride comfort is refined, when engined is warmed, you can't hear the diesel rattle from inside the car, from outside, you will still hear it, but not that bad as I was concerned about. With AWD, you feel confident taking corners, the features and equipment that comes with it, is really lots! Just yesterday when it was a tad hot, the in-seat aircon was a welcomed feature I would have not thought I would ever need otherwise. One more thing, it is a wide car compared to my previous ride...so parking was a new challenge for me, but the onboard parking system (plus Parking Assist - automated self parking) will meet that challenge. Still discovering little things here and there. - Yes it comes with iPod connect, but as long as you have a 2-head 3.5mm jack, you can link your phone...or any other MP3 player to your car. Bluetooth search, call...etc. Cruise control - don't think I will use this in SG. Adaptive head light, very good feature. 4 heated seats for those colder days....(if it ever gets cold here). Thumbs Up for KIA - the Sorentro 2013/2014 model is an excellent ride. Well done! Edited by Echelon, 30 March 2013 - 09:56 AM. No spark plugs, but still got glow plugs. Is it ok to sidetrack abit? As I am considering the new Skoda Octavia that would most likely be coming in next year, from your experience with Skoda, how is the reliability like? What are the issues that you have encountered throughout your 7 years of ownership? Also, if you have been going back to Harvest Automobiles for servicing, how is their service and charges like? SUV u bother about FC for wat? your photo reminds me of a condo somewhere around dairy farm? FC? Very simple. Just to to sgcarmart website to take a look. 14.7km/l = 11km/l (take 25% off) on Singapore roads. Anything better, it's a bonus. Congrats on your new ride! !